ST. LOUIS—March 3, 2016— Moneta Group’s roots in St. Louis date back to 1869, which means that for almost 150 years the comprehensive financial planning firm has been invested in the success of the St. Louis community. In fact, in addition to their own personal involvement in numerous charities, Moneta partners furthered their commitment to philanthropy by establishing the Moneta Group Charitable Foundation in 1999. Each year, the Charitable Foundation selects charitable organizations to provide with grants and to partner with throughout the year; they also have an internal volunteer initiative, Moneta Momentum, which allows employees who are passionate about a cause or organization to petition the Foundation for a financial grant. 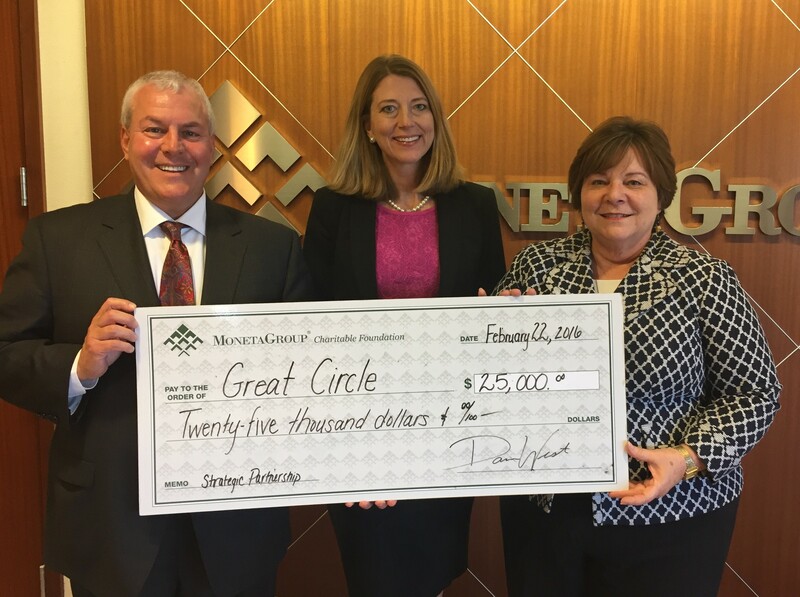 This year, the foundation has selected Maryville University/Kids Rock Cancer and Great Circle to partner with, granting each organization $25,000. The $25,000 grant to Kids Rock Cancer will help support their events throughout the year including the Kids Rock Cancer Talent Show in June and the annual Kids Rock Cancer Benefit Concert in the winter of 2016. These events will help to raise money and awareness for the Maryville University organization, which helps children successfully cope with the unique emotional challenges that accompany a cancer diagnosis. This partnership is being championed by Moneta Group Partner, Doug Weber. The $25,000 grant to Great Circle will help support their cause of serving children and families who struggle with challenging situations often connected to trauma, such as loss, abuse, neglect or witnessing violence. The financial and volunteer investment from Moneta Group will connect children and families to critical behavioral health care services when they need them the most, helping them overcome difficult and challenging circumstances, often beyond their control. This partnership is being championed by Moneta Group Partner, Julie Sward. Moneta’s support of these organizations is just another example of the firm’s corporate stewardship. Through individual gifts of its partners and employees, its participation in numerous nonprofit boards and the work of the Moneta Group Charitable Foundation, the firm contributes its time, talent and treasure to the organizations working hard to make St. Louis a happier, healthier place. In fact, in 2015 alone the firm donated over $250,000 and more than 200 volunteers who donated more than 500 hours of service.